Since the 1960s, the Drake Equation has been used to predict how many communicative extraterrestrial civilizations exist in the Milky Way galaxy. Along these same lines, a new formula seeks to estimate the frequency at which life emerges on a planet—a calculation that might allow us to figure out the likelihood of life arising elsewhere in the universe. Those familiar with the Drake Equation will be familiar with how this works. Back in 1961, astronomer Frank Drake crafted a probabilistic formula to help estimate the number of active, radio-transmitting alien civilizations in the galaxy. His formula was packed with several unknown values, including the average rate of star formation, the average number of planets that can potentially support life, the fraction of planets that actually go on to develop intelligent life, and so on. We don’t have a definitive answer to the Drake Equation, but we’re certainly getting better at filling in the blanks. More specifically, Scharf and Cronin’s equation states that the odds of life emerging on a planet are driven by the number of building blocks that could possibly exist, the number of building blocks available, the probability that these building blocks will actually go on to create life (i.e. assembly), and the number of building blocks needed to produce a given life form. So, in addition to identifying the chemical prerequisites for life, this equation seeks to determine the frequency at which reproductive molecules emerge. Here on Earth, abiogenesis was characterized at the moment when RNA emerged. This critical step was followed by the rise of simple single-celled life (prokaryotes), and then complex single-celled life (eukaryotes). Indeed, one of the major realizations of this study is that planets cannot be studied in isolation. As Cronin noted, Mars and Earth may have been involved in cross-contamination at some point in our distant past—an exchange of materials that may have contributed to the rise of life on Earth. This new research suggests that the transfer of chemical building blocks between nearby planets could significantly increase the odds of life arising on them. “This is a tough question to answer,” said Cronin. “What our work suggests is that solar systems with more than one planet could be excellent candidates for closer study—indeed the main take home message is to concentrate on multi-planet systems and see if any of the planets look ‘alive.” By alive, Cronin says we should look for signs of changing atmospheres, complex chemistry, evidence of complexity, and evidence of variations in climate that could be driven by biological organisms. We don’t have enough empirical evidence to complete Scharf and Cronin’s equation at the moment, but that could change in the future. 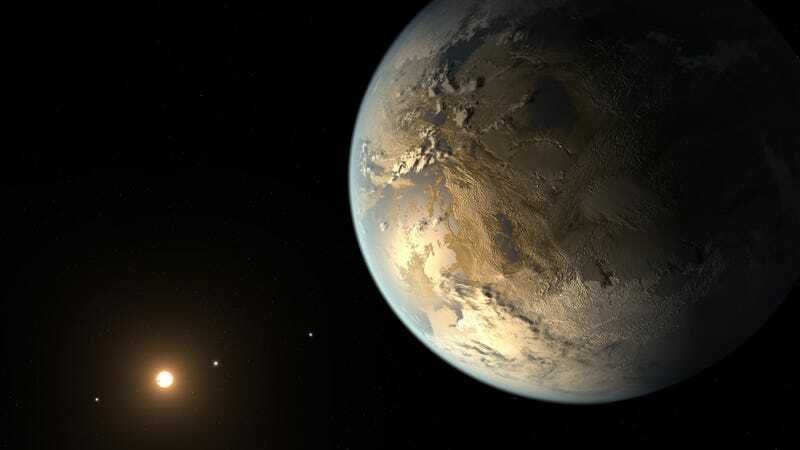 Over the coming decades we’ll be able to use the James Webb Telescope and MIT’s Tess Mission (Translating ExtraSolar planet Survey mission) to come up with the missing values. Eventually, and hopefully quite soon, we’ll finally know the answer to this lingering question.